For a golf weekend away with the guys, a girl's weekend away, a ski holiday or a summer vacation with your family at reduced rates for 2017. Relax in our completely furnished AIR-CONDITIONED vacation condo. The view of Lake Windermere greets you from the Master Bedroom, the Guest Bedroom, the Living Room and the Outdoor Patio. Restaurants, the public beach, the grocery store, and so much more are only a 3 minute walk away. Lake Windermere Pointe is a brand new building that was completed in the Spring of 2008. Brand new, comfortable and modern furnishings greet you as you enter the condo which is perfect for your family or friends. It has Hardwood flooring in the den, living and dining rooms, tile in the kitchen, entry, both bathrooms and laundry room, and carpet in both bedrooms. All linens are included and also includes two brand new wall mounted flat screen LCD televisions to entertain yourself. A 47 inch LCD television in the living room and a 42 inch in the Master bedroom. Also enjoy our fully stocked kitchen that includes all brand new stainless steel appliances, a coffee maker, electric kettle, blender, and toaster. So just bring your Food! Secure underground parking is available. 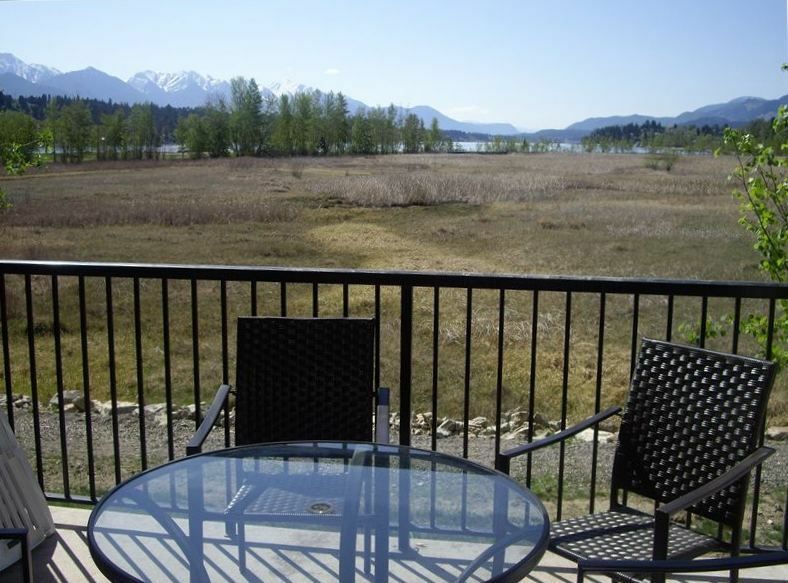 The condo is located right in the town of Invermere which is close to several local golf courses, Panarama Ski Resort, Fairmount and Radium Hot Springs. A brand new outdoor pool and 2 hot tubs have just been completed at the resort. There is also a new exercise/facility building which has a sun bathing deck, full showers, and a locker room. Cancellation Policy: 30 days notice, full refund. 15 days notice - 50 percent refunded, less than 15 days- no refund. Check in and check out must be on Friday - If you are not booking Friday to Friday please contact me so I can assist in making a reservation for you. Great place for families! Our kids loved the pool and park near by!!! We had a great stay! The Condo had more than what we expected with all the appliances and dishes! It is close to one of the beaches and a park which was great for kids. Our boys loved doing to the pool every evening to get tired out before bed! If there was any complaint it would be that my husband didn't like the memory foam on the King bed but that is more preference. I slept great on the bed by he doesn't like memory foam. The kids slept great in the den, the little room separator worked great for giving them privacy at bed time! Would definitely recommend to other guests! Another great week in Invermere BC! We’ve stayed in this complex multiple times over the years and this was by far the best layout and unit we’ve enjoyed. Kids enjoy the pool and it’s close to all the things we enjoy doing in the area! It was a wonderful holiday! The vacation rental was beautiful and everything was exactly as we expected from the description. The pool was great and the perfect temperature. Great location. We would stay here again! WE were there for a guys only golf trip. It had every thing we needed including a bed for each guy. I would definitely stay there again!! We will be coming back again!!! Loved staying in Invermere at Lake Windermere Pointe. Close to everything! Sobeys, Pharmasave and fast food if needed. The pool access was easy and well maintained. Looking out onto the wetlands and mountains every morning and spying Canada Geese, Deer and Osprey was unique... My daughter who can be uncomfortable in new places adapted quickly to the comforts of home. Can't wait to rebook again soon!!! Please contact us for our current rates as they fluctuate throughout the year.